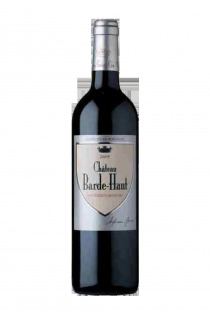 Products of the domain : Château Barde-Haut. Located on the east of the famous commune of St Emilion, at the end of the plateau, Château Barde-Haut develops on 17 hectares through a vineyard facing south and facing the Dordogne, structured in the form of amphitheater. Pretty spectacle that reveals vineyard of the Castle Barde-Haut. Like all areas of the St Emilion appellation, the basements are made of clay flush with the limestone mother rock. Today, it is Hélène Garcin Cathiard, daughter of the owner, and her husband Patrice Lévèque who watches over the evolution of the Château while taking great care of their land and their vines composed of 90% Merlot grape. Equipped with small wooden vats but also stainless steel tanks and raw cement, the breeding takes place at Château Barde-haut in a traditional way. Saint-Emilion Grand Cru - 2014 - Château Barde-Haut.